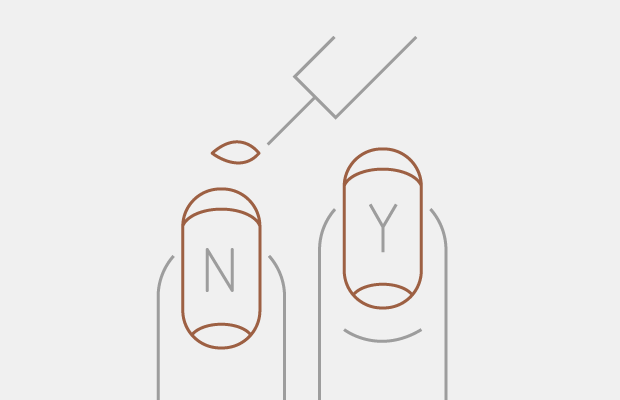 QuestionHow much should you pay for a manicure in New York City? Hopes&Fears answers questions with the help of people who know what they’re talking about. In light of the NYT expose and various rebuttals, we try to figure out the ethical price for a manicure. May's damning two-part New York Times story on nail salons appears to have unstoppable momentum. After Sarah Maslin Nir revealed stories of indentured servitude, rock bottom pay, racist wage discrepancies, wage theft, and severe health hazards for manicurists, the Cuomo administration investigated labor violations, signed stricter enforcements into law, and produced a workers' bill of rights which salons are now required to post in their businesses. The Times ran a follow up story with an updated survey of workers and businesses. A couple days ago, a former New York Times reporter and current nail salon owner posted a rebuttal in the New York Review of Books, accusing Nir of cherry picking her examples and profile subject. The New York Times issued a rebuttal to his rebuttal. It's an object lesson in the potential for workers to voice their problems, government retribution, ongoing press follow-up, and meaningful public discussion. That leaves us to wonder, what role do mani-pedi buyers play in all this? Does the amount we're willing to pay contribute to lower wages? Is $10 simply too low to pay for a manicure? I believe that manicurists are not unlike cosmetologists or estheticians in the sense that they work a trade. Unfortunately the common consumer perception of manicurists is that they are service workers like waiters and waitresses, and with the added perception of manicures being cheap labor since it is commonly designated as work for foreigners, most manicurists get tipped quite poorly. During my experience as a manicurist, the vast majority of my tips ranged between $3-$5 regardless of the services I performed. I would like to see a complete overhaul of the pricing structure of mani-pedi services to emulate those of countries like Japan and Korea where it's generally accepted that these services are costly and time-consuming. While manicurists in Korea typically do not receive tips, they receive a base monthly salary and a 30%-40% commission of the services performed as opposed to manicurists in the USA who typically work for tips and minimum wage. Nonetheless, breaking the pricing down to each specific service not only allows the establishment to price each service more accurately based on the level of skill and cost of materials required it also communicates to the customer a more accurate idea of what they are paying for, and to tip accordingly. Other suggestions such as setting a price floor for mani-pedi services and rating individual salon businesses with a letter grade for hygiene like restaurants would be ideal but are unlikely to be instituted any time soon. It is my belief that raising the minimum price of mani-pedi combos to $60, as well as actively communicating to consumers the true cost of mani-pedi services, is vital. NYT: A task force set up by the Cuomo administration inspected 755 salons and issued 1,799 violations in the two months following the piece. There's no formula for how determining how much a manicure should cost because what proportion goes towards workers’ compensation is completely up to the discretion of the salon owner. Would the business be able to manage all of its expenses if it were paying workers fairly? It depends on how much rent is, operating costs, and many other factors. We have a minimum wage law with minimum overtime requirements. Most salons don't follow minimum wage laws and overtime requirements. One of the problems we often see is owners trying to shift their responsibilities by relying on customer tips. H&F: Do you believe that customers might be willing to pay more for manicures from a white salon? Is there a discrepancy in cost expectations? I wouldn't be surprised about what you're saying; I think there's a lot of entrenched racism revolving around the notion that immigrant workers should feel lucky to be getting work at all or that immigrant-run businesses exist to provide cheap services and are able to do so by violating the law to keep costs down. The flip-side of these ideas is that customers might assume that salons owned or operated by whites are compliant with the law or that white workers expect to receive lawful wages and that those expectations deserve to be met. But I do think most workers are aware of their rights; the problem is a matter of getting other stakeholders to care. The New York Times article was really written in collaboration with worker centers, people who have been organizing around these issues for years. They've been trying to get the attention of journalists and other stakeholders for a long time. The tremendous response the article has generated could be because people are just more ready to hear about this because of other minimum wage movements that have been taking place nationally. NYT, July 17th: More than 40 percent of the salons surveyed by The Times did not have on display the state’s newly required workers’ bill of rights, which outlines information on minimum wage and where employees can go for labor complaints. The salon charges $18 for a basic manicure and $30 for a basic pedicure. Nail art starts at $10. I don't think it is an easy question to answer. To be fair, it really depends on the operation cost of a salon. Take my salon for instance; the biggest expense aside from payroll is rent. It could vary significantly depends on the location of the salon and the cost of products used. The bottom line is, there is reason why some salons can afford $20 for manicure and pedicure, and some, like pH7 can't. H&F: Do you think there's a particular standard business model that should be adopted, like a percentage of the cost of manicures that employees should receive? The percentage can hurt manicurists' pay unless it is a salon that have a very steady customer base. Reading the article from NY Times and talking to the manicurists work at my salon, those who make $20 or $30 a day is likely due to the fact that they were on commission base. Nail salons can be very seasonal; if they were on a commission basis only plus tips, during the off-peak season, it is not unusual for them to be making below minimum wage. Then, during peak season, the income can be very appealing. That is common in areas where they offer $20 manicure and pedicure. I believe it is a better practice to have a set hourly rate, plus tip and commission on certain services, like massage or more extensive care services that would take longer time. Are workers paid at least the minimum wageand overtime? Is there adequate ventilation (no strongchemical odors)? Is the salon business license posted inplain view? 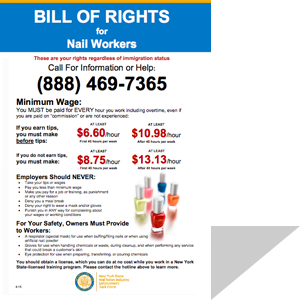 Is the Nail Salon Workers’ Bill of Rights posted in plain view? To voice concerns, call the Nail Salon Industry Task Force Hotline: (888) 469-7365 or learn more.